Keramag Renova Nr.1 is one of the most successful bathroom series worldwide. But why is it so? 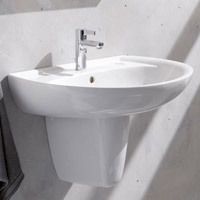 In the first place this is certainly due to the timeless design of the bathroom ceramics in combination with the countless variants and combination options, because Renova Nr.1 convinces thanks to a variety of wash basin variants ranging a width of 55 cm, over 60 cm and 65 cm to 70 cm, as well as wall thanks to numerous WCs and floor standing WCs. Whether you are looking for a Keramag Renova Nr.1 wall-mounted toilet without rim or a wash down WC with a cistern and the matching Keramag Renova Nr.1 toilet seat, the appropriate Keramag Renova Nr.1 bidet or urinal of this bathroom ceramics’ series will leave you free also to choose the size of the hand wash basin and offers numerous options with regard to the matching bathroom furniture, as they complement your Keramag Renova Nr.1 selection optimally.